Space, wild and free, and it's yours for the taking! Our solar system and its planets are ripe for the picking, treasure troves for the brave and bold adventurer. So what if the Martians or the savages of Venus would rather we stay home? They'll be happy campers once you've subjugated them, strip-mined their resources, built shoe factories and taught them the rules of cricket. Everyone likes progress. Prepare your forces to conquer the savage solar system and beyond. Onward to Venus! 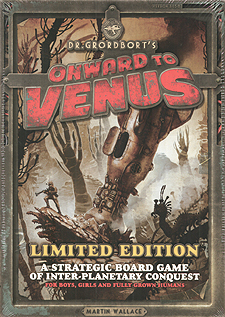 'Onward to Venus' is a board game for two to five players based on the graphic novels of Greg Broadmore. The game plunges you into an alternate reality where space travel and ray guns exist in an end-of-the-nineteenth-century setting. You will take control of one of the major Earth based empires and compete with your fellow players to colonise the planets and moons of the Solar System. Rather than play on a standard board you will arrange eight planets and moons in a line on the table of play. You must use your military forces wisely to take control of mines, build factories, and defeat uppity rebels. All of this is brought to colourful life through the extensive use of Greg's imagery. Prepare yourself for a visual and mental treat. This is the limited edition game, of which only fifteen hundred copies have been produced. The game contains one set of English rules, an English player aid card, seven full-colour counters sheets, one-hundred and thirty two high quality cards, three customised dice, two-hundred and sixty nine custom designed wooden components, and a cloth bag.